In a new tactic MIL Collections claim to have won 7 cases against people being assisted by online users claiming to be experts. No further details are available, and The Prankster has been unable to trace any of these cases online. Here are a sample of cases where information is available, and the outcome of the hearing threw up a surprise to MIL. MIL Collections website does not have any information about these cases, but does offer this advice. Why has MIL not responded to the numerous negative comments made on the Internet? Most comments we have reviewed, are either dishonest or trolling. For reasons of privacy and fairness, we do not routinely comment publicly about live cases or judgments granted by Court. The MIL website has links to free advice services allowing people with a genuine grievance or dispute to obtain free independent advice and support. Fee charging legal service providers can be checked on the SRA website to ensure they are regulated and indemnified to offer legal services to the public. The Prankster has not been able to identify comments which are dishonest or trolling, so wonders if MIL are using a different internet to everyone else. However, here is an up to date comment from the internet most people use. This comment appeared on 10/01/2016. 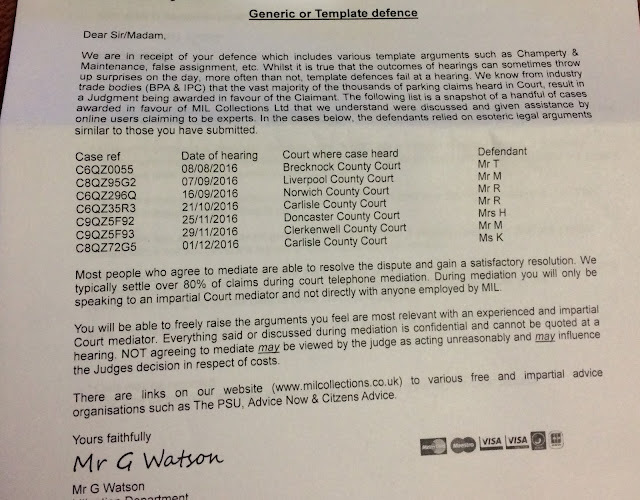 It appears in the real world, as opposed to the parallel universe Mr G Watson seems to inhabit, MIL are very much aware that they have little chance of succeeding in court. Although MIL claim to have been told by the BPA and IPC that thousands of claims are won in court hearings, this appears to be made up data. The BMPA data suggests that only around 2,000 parking hearing occurred in 2016. Of course, MIL will have their own statistics apart from the data they claim the BPA and IPC provide. The Prankster suggests that they are not publishing that due to their embarrassing lack of success. According to the BMPA, 232 MIL cases made it to a hearing in 2016. As a side note, MIL Collections appear to have obtained data from the parking company in breach of data protection laws and The Prankster advises considering investigating this and filing a claim against them and the parking company if this is true. Parking Cowboys have an article on claiming for a data protection breach. Its not unknown for a NoD to be sent to a vicitim which for some inexplicable reason is never sent to the court allowing the PPC a default win when you do not attend or meet filing deadlines. I'm asking the obvious, but has anyone checked that MIL have actually won these seven cases? Worth noting that the Online assistance never says it is the Experts, and even the appeals companies out here make it clear that they cannot guarantee a win. Does anyone know how case numbers are allocated? What are the odds of two cases in different courts having sequential numbers? C9QZ5F92 and C9QZ5F93. It also makes me laugh that MIL seem to think that Generic or Template defences are problematic but template claims are perfectly acceptable. Indeed. As I understand it efforts are made to respond to specific points raised in their claims whilst their witness statements simply plough the same, tired old furrows without ever providing "strict proof". One is tempted to think that they don't actually have it or perhaps they don't care? This all highlights the MO, robo claims, no effort, hope for default wins or a cave in at mediation where many defendants don't understand the mediators sole aim is to prevent a court case and they really don't care for the facts of the case at all, they have to proceed enough to court for the threat to have teeth, but probably don't want to at all unless they know it's a rubbish defence. They are issued centrally. QZ is MILs code, so this will be two MIL cases filed one after the other. There seems to be a number of signatures around that are questionable? Does Mr G Watson really exist? Its rare to see such a legible signature, as most people personalise their monicker? Unless he sits opposite Mr Sherlock perhaps? Mr G Watson may exist but that isn't his signature or any signature at all. It's in a standard Windows font called Segoe Script. Having just come off the phone to MIL (I know, I know, but I like to live dangerously), I can confirm that mr G Watson does not exist. I asked the call handler if I could speak to him, and she sounded very confused, and said she knew of nobody of that name. I asked for Alan, but he was in a meeting.